Looking for a good date movie or just something to take your mind off things for an hour or two? One word: Disney. With all the great Oscar movies out lately, us movie buffs have been spoiled for choice. Black Swan, The King’s Speech, The Fighter; all great films, but this week I decided to go see something a little less award hungry. 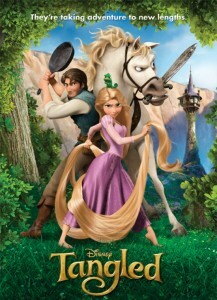 Disney’s latest foray into CGI, fairytales and princesses offers us Tangled. I’m not ashamed to admit that I’m a Disney junkie. I’m a connoisseur of the House of Mouse. So whenever a new Disney movie comes out, I desperately want to like it. Unfortunately, the last few years have given us such tripe as High School Musical and Hannah Montana so my opinion is tainted. Having said that I went to see Tangled with an open mind, after all Toy Story 3 proved awesome! Turned out, so is Tangled. Glory days, Disney is coming back. 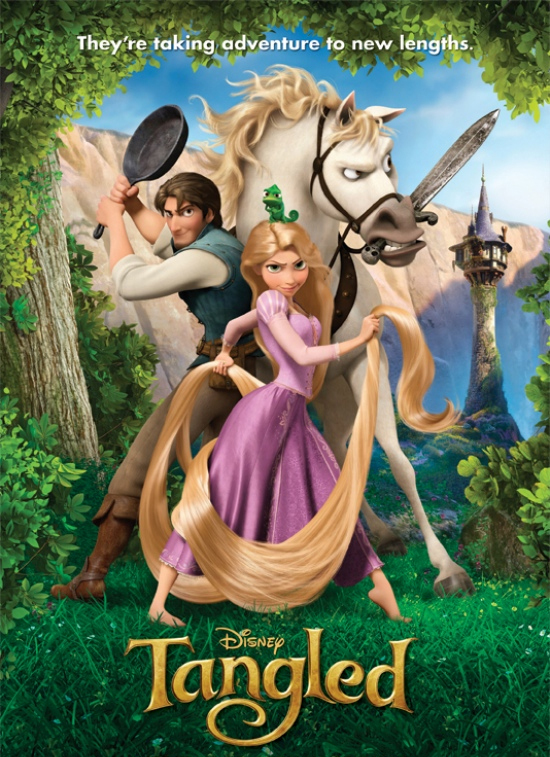 Tangled tells the story of Rapunzel which, as everyone knows, is about a girl who gets locked in a tower and her hair grows to an enormous length, allowing a prince to climb up and rescue her. Tangled thankfully brings a slight change to that story in that Rapunzel is a princess with magic, healing hair and is kidnapped to keep our villain looking young and beautiful. The prince is turned into a thief who tries to hide out in Rapunzel’s tower after stealing a crown from the royal castle. He meets his match in the young and most naïve Rapunzel who hides his crown and promises only to give it back if he brings her into the real world and away from her tower for a day. The thing about Tangled that differs from Disney’s usual fairytales is that the emphasis is on the male lead just as much as the princess. Flynn gets as much screen time as Rapunzel and its well deserved. Voiced by Chuck’s Zachary Levi, the character is probably the highlight of the movie. He is, in a word, hilarious. The character of Rapunzel is not really anything new. Charming, beautiful, ambitious but so what? That’s what a Disney princess is! The visuals of the film are astonishing. The makers planted CGI characters onto painted backgrounds so even though the film looks hand drawn, thanks to CGI, every wisp of hair and blade of grass is stunningly visible. It’s definitely something art students will want to take a look at. The music is helmed by Oscar winner Alan Menken who has written music for films like Beauty and the Beast and Aladdin so you know it’s good. There’s a lot of humour in the movie, mainly from Flynn and it’s the typical ‘it’ll go over the kids’ heads but adults will get it’ style that Disney is expert at. But overall, the movie has a heart that we haven’t seen from Disney in a very long time. We got it from Toy Story 3 and we got it from Tangled. All I can say is keep going the way you’re going, Disney, and we might just forgive you for setting Miley Cyrus on us.